tripsEver wonder how you can help DASH? I know, right? One of the best ways you can help is to be at the gala (and no this is not some lame high school looking event). It’s a party in the middle of the Design District, with food from world class restaurants, great entertainment and a silent auction you would not believe. 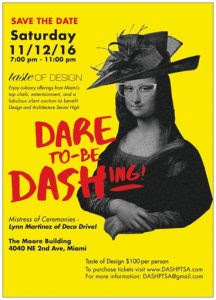 Help DASH and buy your “Taste of Design” ticket now.